I’ve now worked with the Jw Library on 2 Kindle Fire HD, two of the new Fire 5th Generation various phones and a IPad. Except for the iPad I’ve had this problem at times with all of them. First it is good to understand that JW Library is a resourceful incentive program. Not many applications are this complex and use so many different forms of data. So you have to expect it to be slow at times. However there are two main times I have found it to slow down or even stop. Several things happen the first time you run the application after installing. It’s best to have other applications turned off the first time you use this application. Once that is done it doesn’t compete for resources too bad with other applications. Also, make sure you have a good internet connection the first time you start it up. The application seems to download additional information the first time it starts up. Phones that access the internet slowly and other devices that are connected to a slow internet can expect to have to wait a minute or two watching a spiraling circle as the program loads. I’ve had this startup talk over 5 minutes the first time. After that the application will load much quicker. You will also need to download your first bible. Choose your language and wait for it to load. 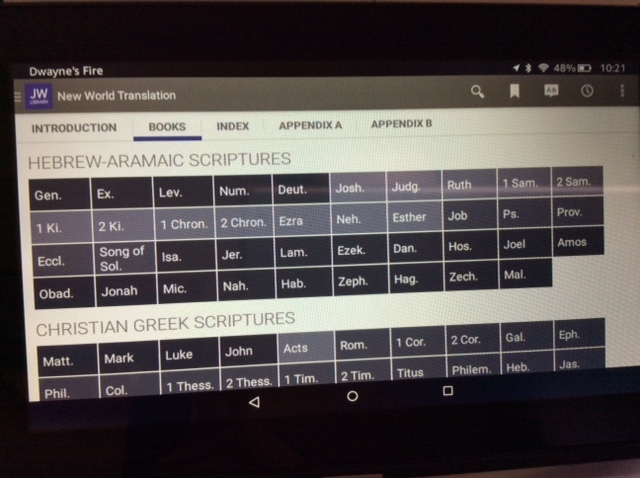 Depending on the language, the bible can be 15 to 40 MB. 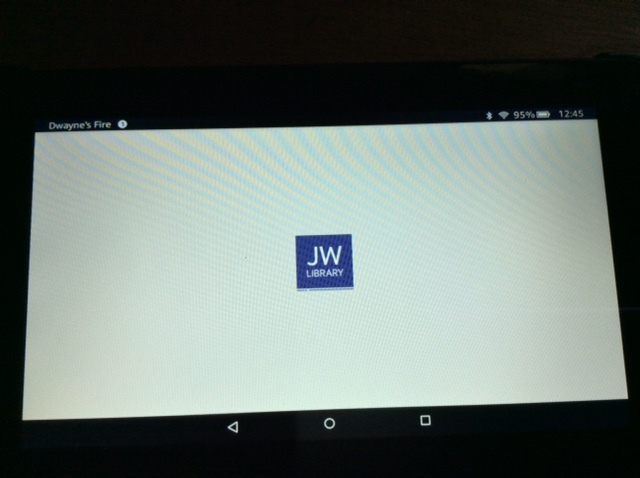 That will need to load before the JW Library application loads the first time. If you have a mini sd card (additional memory) installed or you plan on adding one, do not start downloading any other literature yet! Once things are loaded on your kindles on-board memory it is a little more difficult to get those items moved to the sd card. You need to make setting changes in two locations first. I’ll address these changes in a different post. To sum up this subheading, while there are things you can do to minimize the wait, in particular make sure you are connected to a fast internet, there is little more you can do than wait. I have had one phone though that never started up. I needed to delete the application and start the process again, the second time it worked. 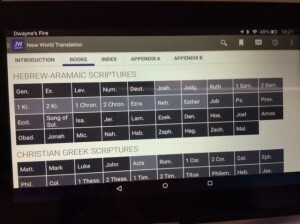 So, your thinking about getting one of the new Kindle Fires to use for the meeting or field service! You probably have some questions on how well a $50 tablet is going to work. So did I!. I’ve now bought a couple of them, my family also has a couple of the Fire HD and my main tablet is a ipad so I thought I would give you some pros and cons, tips on setting it up, comparisons with some of the higher end tables and tips on what to do when there is a problem like the tablet locking up. My main reason for the table is to use in the service. We show the videos a lot in the DR and there are a lot of times where I can’t read my bible due to poor light, or simple a bad eye day for me. In ether case I can read the Kindle fine. I have a better tablet that I use for the meetings. In my area it is a little more dangerous to carry around expensive electronics so I don’t like using my iPad in the service.